At the end of time, people of every language—including Spanish—will worship around the throne of God. Studying Spanish at BJU, you’ll learn how language shapes how people think, and how you can use this knowledge to more effectively communicate with Hispanic people. You’ll study the Spanish heritage and worldview through courses in history and literature, plus you’ll receive a solid foundation in the linguistic structures of the language. More importantly, you’ll explore the Word of God in Spanish so you’ll be able to edify Spanish-speaking believers and share the Gospel with the world. 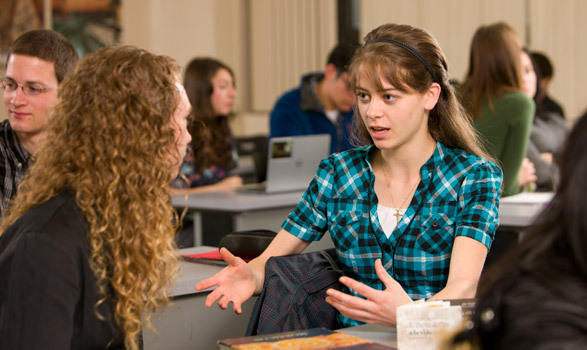 BJU’s Spanish program focuses on giving you a strong proficiency in the language. As you gain fluency, you’ll develop your knowledge and communication skills in writing, speaking, history and literature. Because culture and literature are extremely important to many Spanish speakers, courses in these areas help you understand their world and connect with them on a deeper level. One of the most exciting things about studying Spanish is that it prepares you for a wide variety of vocations. Your courses and opportunities outside of class will prepare you to speak fluently under pressure (this would be at the advanced level, according to ACTFL’s proficiency guidelines for interpersonal communication). 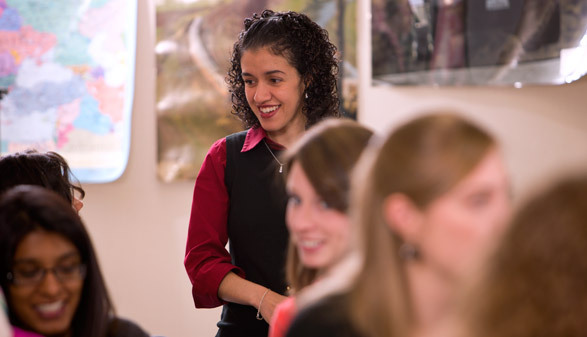 BJU’s Spanish program equips you with skills to excel in a variety of positions, from business to health-care interpreting opportunities to government work. During your studies, you’ll have plenty of opportunities to apply your Spanish in practical ways both on campus and in the community. The ability to connect with people from all walks of life—as Jesus did with farmers, soldiers and business professionals—is one of the many skills you’ll strengthen through the BJU Core. Courses in Bible will help you articulate what you believe and help you confidently share why you believe God’s Word. And through subjects such as history, economics and science, you’ll be better equipped to weave biblical truth into your daily conversations and interactions with others. In addition, you’ll learn that language finds its home in history—that’s why the BJU Core complements the Spanish program so well. Your studies in other academic areas, such as history, psychology and the arts will give you a better understanding of all people. And coupled with your Spanish courses, your liberal arts courses will help you understand the worldview and values of native Spanish speakers. As part of the Spanish program, you’ll choose a second language from one of the other modern languages offered at BJU. Additionally, you’ll have the opportunity to choose from a variety of electives. Courses in business and communication are helpful and complement a Spanish degree well, providing knowledge and skills that you can use in almost every industry. And courses in science, psychology and the arts are great choices if you’re planning on using Spanish in those fields. With the flexibility of the Spanish program, you can choose the electives that work best for you. As difficult as I felt they were at the time, my writing and grammar classes really helped me. I have been told that I write better than a lot of native Spanish speakers because I have had more training. My literature classes were probably the most stretching and most engaging classes that I took because the teacher did not just lecture. She expected us to have conversations during class and to use our Spanish. With the increasing number of Spanish speakers in the United States, studying Spanish opens up your future tremendously. You’ll have access to the typical language careers such as those in teaching and interpreting, but also have more adaptability in many more careers and ministries. BJU’s Career Services office helps both students and alumni through career advising, resume preparation, job search assistance, recruitment conferences and more. In addition, over 60 businesses and 150 Christian schools/mission boards/Christian organizations come on campus to recruit students through on-campus interviews and job/ministry fairs. Practical experience, especially in a language, is essential. That is why BJU’s Spanish faculty encourage your involvement with native speakers, both at BJU and abroad. These opportunities will help you better understand spoken Spanish and in turn help you better communicate with others. The University Language Association is a student-run organization that brings in Spanish speakers from various countries and occupations to give you opportunities to see the connections between Spanish and future careers. You’ll also learn about needs in Christian ministries around the world so you can give of yourself through prayer and other means for the glory of God. There are a growing number of Spanish speakers in Greenville, S.C., providing numerous avenues of service. Your opportunities range from serving in a Spanish-speaking church to working at non-profit organizations that assist Spanish speakers. Spanish faculty members can help you get connected so you can grow in your proficiency of the language. During your time at BJU, you’ll have the opportunity to travel to Spain in the summer. During the four weeks in Spain, you’ll take two on-location immersion courses—you’ll spend mornings in class and your afternoons visiting historical sites and using your skills in the Spanish language. View details. Your Spanish faculty are both knowledgeable and enthusiastic about their subject. All have traveled extensively to Spanish-speaking countries, so they teach from their firsthand experience of cultures and dialects. In addition, they have presented academic papers at international conferences such as the Association for Classical Hispanic Theater and the South Central Modern Language Association. And above all else, they have a passion for God’s work around the globe and equip you in serving God wherever He leads you. Communicate in Spanish at the Advanced level in the interpersonal mode. Communicate in Spanish at the Advanced level in the presentational mode. Understand Spanish at the Advanced level in the interpretive mode. Evaluate Hispanic cultures from a biblical worldview.